The New Chapbook is Out! What would happen if a Sufi mystic showed up in your kitchen? Or at your son’s elementary school choir concert? Or in your garden? 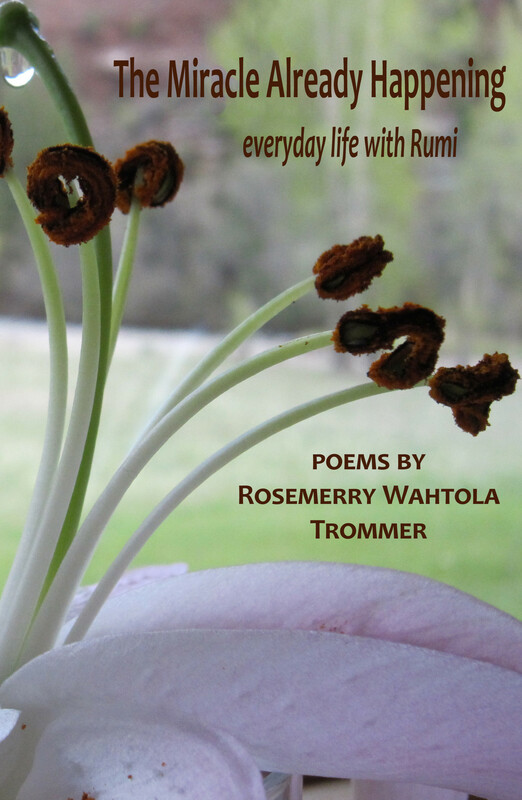 In this playful chapbook, Rosemerry Wahtola Trommer has poetic conversations with Rumi through his translations by Daniel Ladinsky and Coleman Barks and through her imagination. Whimsical and humble, these are poems of discovery, praise, and unlearning, invitations to find holiness in every moment, every place. Even Walmart. A delightful collection of poems to savor and treasure … a deep oasis for all who seek to experience the sacred in every moment. A rare treat: a rigorous conversation with the past made fresh by vulnerability, playfulness, humor and knockout surprise. There is so much integrity here, and discipline, and grace. And restraint, and cutting loose all at once. All this in poems that can be surrounded by a great quietness. The sensation can be like listening for birdsong, and having the bird silently and suddenly land on your shoulder. If you don’t fall over, you will shout or laugh. One of the wonders of recent poetry has been the renewed popularity of the Sufi mystic, Rumi. Rosemerry Wahtola Trommer confirms that great poet’s new life in remarkable poems of her own, conversations with a distant master that make us aware just how near he really is, how helpful in his teaching. To order a signed copy: email Rosemerry at wordwoman@mesa.net and include your mailing address and to whom you want your books signed. She will send you an invoice for the book plus shipping. I love it so much, and just bought it, and soon I’ll have my very own copy!!! Can’t wait to read it! I enjoy your Rumi poems so much! !